Big American airlines have been crying foul over subsidies they say benefit their Middle East rivals for a long time. Will President Trump listen to them? U.S. airline chief executives will bring their grievances directly to the White House on Thursday, when many will meet for the first time with Trump. 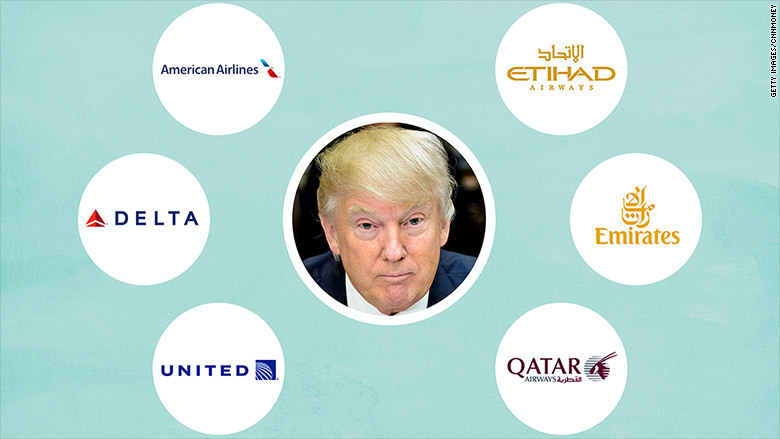 The CEOs of Delta Air Lines (DAL), United Airlines and American Airlines (AAL) wrote to Secretary of State Rex Tillerson last week, repeating their objection to the "massive subsidization" of Etihad Airways, Emirates Airline and Qatar Airways and appealing to Trump's "America First" mantra. "The Gulf carriers have received over $50 billion in documented subsidies from their government owners since 2004," they said in the letter. "If left unchecked we will continue to see the Gulf carriers expand in the U.S. market, causing further harm to hard working Americans." The three biggest U.S. airlines want the U.S. government to review the Open Skies agreements that allow the Gulf carriers to fly freely from the United Arab Emirates and Qatar to any U.S. destination. The U.S. CEOs say the two nations are "abusing the agreements, and our government has done nothing to stop them." The Gulf carriers have been growing fast in the U.S. Earlier this year, Emirates announced a new service between Dubai and Newark, with a stop in Greece -- a provocative move on the lucrative North Atlantic market traditionally dominated by U.S. and European airlines. Newark is the 12th American destination for Emirates. Qatar Airways is not far behind its regional rival. It will have 11 destinations in the U.S. once its new Doha-Las Vegas service starts in 2018. All three Gulf airlines have in the past rejected the allegations that they're being given an unfair advantage. In 2015, Emirates released a detailed report stating it does not depend "on government subsidies, bailouts, and bankruptcy laws, but operates as a consumer-focused, profit-driven, commercial enterprise." Emirates and Qatar Airways declined to comment on the potential for protectionist measures under Trump. 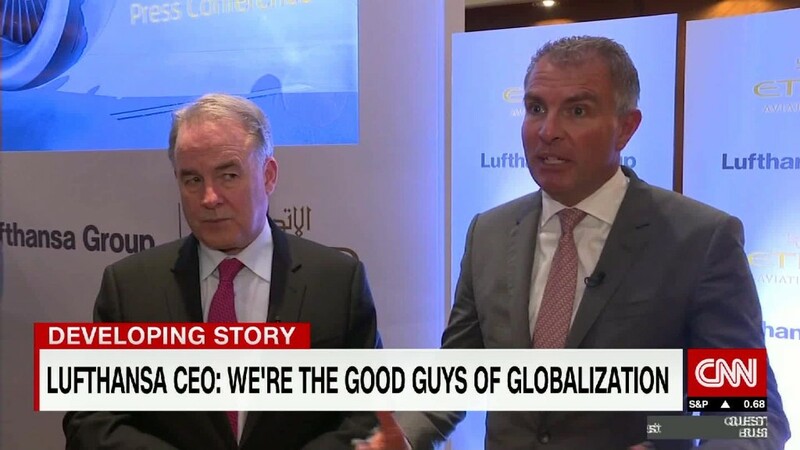 In an interview with CNNMoney, Etihad CEO James Hogan said it was too soon to speculate. "In regards to how that's addressed moving forward we will have to wait and see. At the end of the day you can only work with the issues that are in front of you. If those issues are raised again, we will tackle them," he said. Etihad, which flies to six American cities, is not planning to expand in the U.S. this year. But its home airport in Abu Dhabi has a facility for U.S. bound passengers to complete immigration and customs inspections before boarding. U.S. airline opposition isn't unanimous. Air carriers like Hawaiian Airlines and JetBlue Airways are part of a coalition pushing for the Open Skies agreements to remain unchanged. Those airlines want to keep passengers on the Middle East airlines flowing to their U.S. flights from overseas. Members of the coalition, which includes FedEx, are also seeking a meeting with Tillerson. Taking action against the Gulf carriers is not without risk for President Trump. For starters, their aircraft orders support lots of American jobs. The three airlines, clustered within an hour's flying time of each other, have bought billions of dollars worth of Boeing (BA) airplanes and have billions more on order, supporting thousands of U.S. jobs. That has earned the trio a powerful ally in Washington, D.C., though Boeing has declined to take a public position for fear of upsetting American airlines. For Trump, it would mean taking on an old friend, Qatar Airways CEO Akbar Al Baker. "I have always said that the rhetoric that surrounded Mr. Trump's campaign with respect to our region is only political in nature, and I am certain that the road ahead will clearly demonstrate that Qatar and the United States have enjoyed a long standing partnership and are close allies."